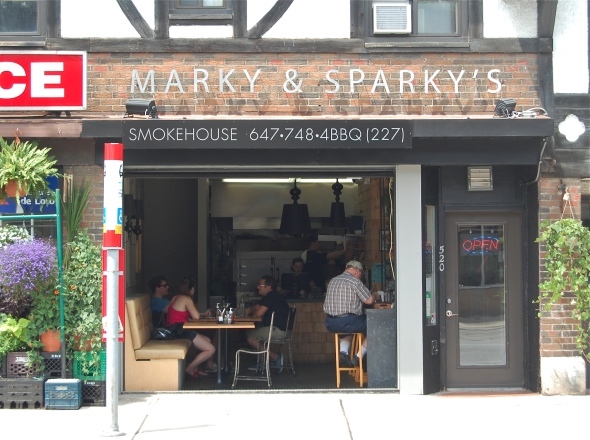 Marky & Sparky's menu doesn't mess around, offering an array of classic barbecue favourites, including ribs, pulled pork, brisket, chicken wings and all the sides you would expect. 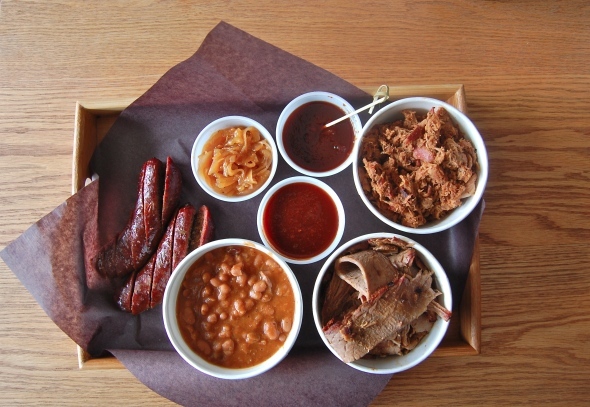 At this new Junction-area eatery the meat is slowly smoked with hickory and applewood in a Southern Pride smoker , the better to impart the flavour and create the texture that is the mark of good 'cue. 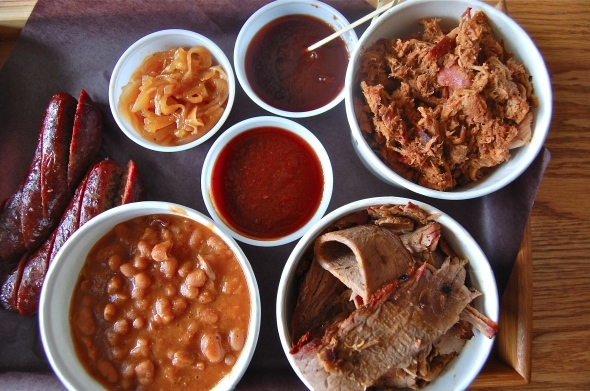 With an array of appealing options we take the safe route and go for the butcher's platter ($60, serves 4), which includes a bit of just about everything. The dry rubbed ribs ($15 half rack/$25 full rack) come out charred black, and it may take a brief inspection to find a speck that looks seemingly edible. Don't be fooled though, as the dark exterior hides a vividly pink interior that is almost completely devoid of moisture; all that remains is insanely intense flavour. 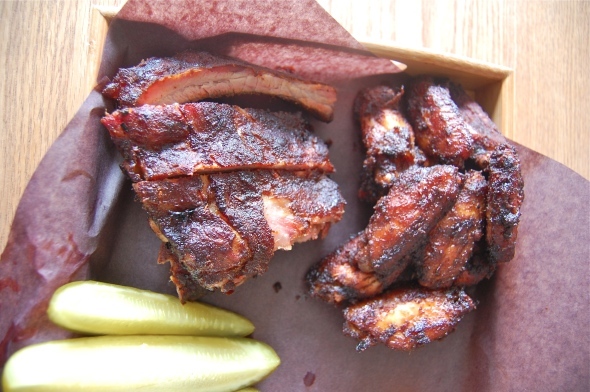 Possessing the requisite smoky and sweet notes, these ribs are seriously addictive. Brisket ($11 for a sandwich) and pulled pork ($10 for sandwich) don't quite rise to the same heights. The pork is amiable enough, tangy and sweet moreso than smoky, with the tenderness that comes with being slowly cooked. 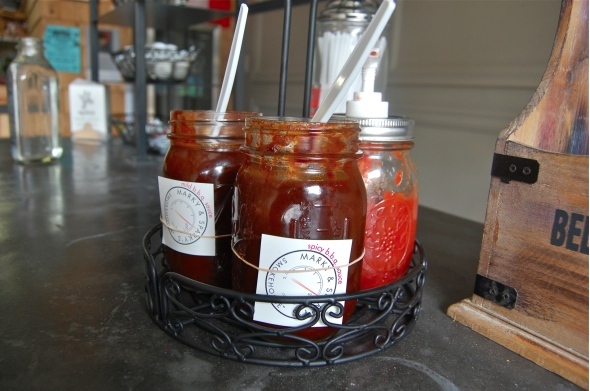 It's let down by its companion though, an almost sickly sweet, house made barbecue sauce that comes in either mild or spicy (although in this case spicy is a relative term). The pairing with the pork is wholly redundant, sweetness on sweetness when a touch of acidity is really what's needed. The overall result is one that just can't hit the high notes in the same way the best barbecue does. It's better than the brisket though, which is not quite tender enough or flavourful enough. The result is perfectly acceptable, though a bit disappointing in comparison. Fortunately the chicken wings ($10 for 10 wings) don't suffer from the same fate. They pack a seriously mouth-watering wallop, with the sticky, spicy, smoky, sweet coating counterbalanced by a tender and moist interior. It's a 1-2 punch that will knock you out and then bring you back wanting more. And since they're smoked and not deep-fried they're healthy, right? The smoked pork and fennel sausage ($10) makes much less of an impact as the fennel is muted and the sausage lacks fat, leaving the resulting sausage overly dry. With that being said, it's saved by a really dynamite sweet onion jam, which adds the required flavour and moisture to the texturally interesting but otherwise unremarkable sausage. The sides are generally good - the baked beans ($4) in particular. They're smoky and rich, and flecked with enough spare bits of 'cue to make them almost a meal in and of themselves. Caponata ($5), a slow roasted mix of zucchini, peppers, eggplant and onions, is also nice, albeit a bit oily, with the medley appetizingly roasted to the point of disintegration, with each vegetable nonetheless remaining distinctive. A sample of smoked gazpacho ($4.50 regular portion) is also cool and refreshing on a hot day. We may have gotten day old jalapeno and sundried tomato cornbread muffins ($1.25 each) though, which were hard, dense, and tasted of neither jalapeno nor sundried tomato. Service is friendly; a cup shortage at the beginning of our meal was sorted out after a few minutes, though the restaurant isn't licensed and the drink selection is fairly limited. 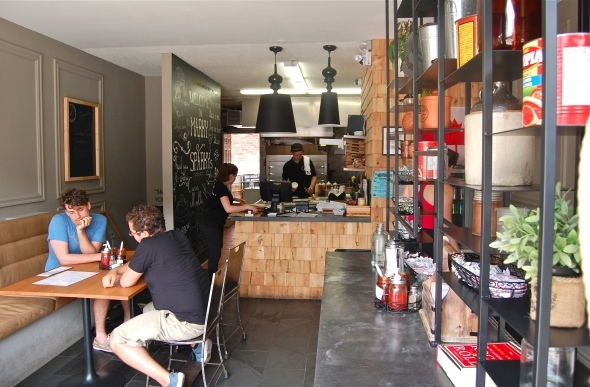 The premises are also tiny, so at peak hours be prepared to line up or take-out (you can call ahead). The meat is expensive on account of its quality - Butcher by Nature owner Frank DiGenova is the titular Sparky - but portions are plentiful, and we can't quite finish our platter. The overall experience is a positive one to be sure. It's practically impossible to excel at every major barbecue category in one restaurant - both of the Carolinas basically specialize in pulled pork, for example - so credit to 'cue master Marcus de Simone (Marky) for a credible effort all around. The chicken and the ribs are the real standouts so focus on those and you won't be disappointed.